I’ve got a sociological experiment for you to try out at Munich's famous marketplace. I want you to browse through some of the market’s 140 stands. 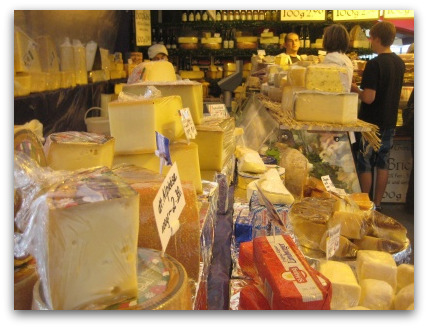 Take a look at the cheeses, the fine meats, the flowers and the bakeries. Then, I want you to go to the fruit and vegetable stands – pick up a potato, toss a tomato from hand to hand, smell strawberries one by one. Don’t push it too far, just scout about like you’re an insatiable connoisseur looking for the perfect peach. See how the shopkeepers steam up as you play with their produce, and time how long it takes before one blows his top and lets fly with a string of insults. Then write in and let me know how long you last. 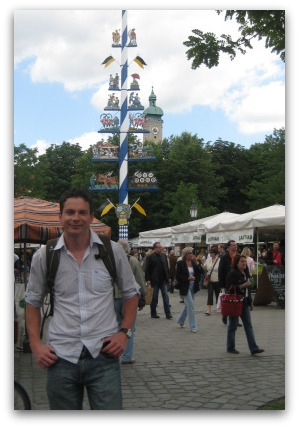 POLE POSITION: Me in front of the maypole (Maibaum). You see the market vendors are renowned for being grumpy as hell, particularly when it comes to potential customers handling the goods. Once, an American tourist copped such an ear-battering it made the daily newspapers along with an official’s plea to the vendors to be "a little nicer". Let's see if the stereotype holds true. That said, an amble through the village-like market, a long-time focal point, easily makes it most people’s "things to do in Munich" list. It’s a cornucopia of gastronomic delights. Expensive, but high quality, and from the world’s four corners. Everything from sushi to sandwiches to souvlaki gets a run. Centre point is the beer garden, the only one in Munich that serves a variety of city’s beers on a rotating basis. During winter the big Maß beer glasses are traded for smaller cups of Glühwein, a hot, spicy wine best enjoyed in a thick jacket and a huddled group. More food is dished up in the glass-encased Schrannerhalle at the southern end of the market. This hall is a popular venue for soccer fans – you can enjoy a glass of Prosecco while following the on-field action on a big screen. The Schrannerhalle was opened in 2005. Its name comes from an old grain-hall on the site which burned down decades ago. Rising from the centre of the market is the blue-and-white striped maypole (German: Maibaum). Maypoles can be found in village squares across Bavaria and once served as a kind of medieval Yellow Pages for travellers – the attached signs indicate the goods and services available nearby. The Viktualienmarkt maypole bears symbols of a beer-cart, carousels, dancers, musicians, and near the top a lonely little fruit lady. The pole is raised by a bunch of Lederhosen lads with a fair share of fanfare on May 1. Another highlight of the Viktualienmarkt calendar is Shrove Tuesday (Fashing Dienstag) in February or March. drink champagne and party the day away. The main event is a colourful and plainly ridiculous dance by the women who work at the market, the so-called "Tanz der Marktfrauen". SAY CHEESE: Inside one of the stands at the Viktualienmarkt. Other events include the opening of asparagus season in April, a brewers’ day and gardeners’ day. 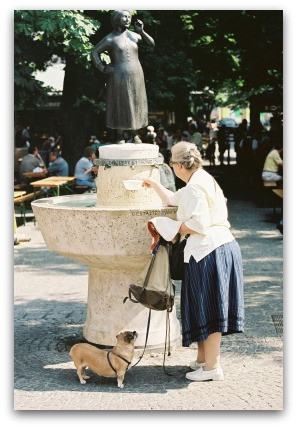 Keep your eye out for the fountains spread around the market – each immortalizes a famous Munich comedian or entertainer. 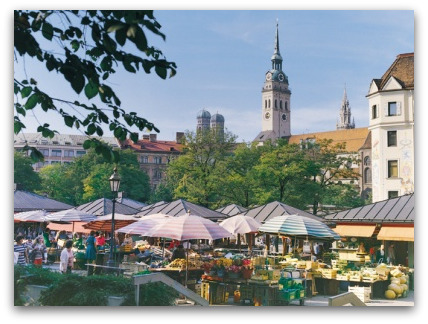 The market was relocated to its position, just south of St Peter’s Church in 1807 by King Maximilian I from its original spot on the Marienplatz. The name "Viktualien" is an old Latin word for groceries. Location: Am Viktualienmarkt, just south of the Marienplatz. Open: Food stalls are generally open Monday to Friday 7.30am to 6pm, Saturday 7.30am to 1pm, closed Sundays and public holidays. The Schrannerhalle is open 24/7, but the businesses inside keep their own hours. The beer garden is open 9am to 10pm, closed Sundays. Directions:Take any S-Bahn or U-Bahn No. 3 or 6 to Marienplatz, then head south-east of the square, past the St Peter's Church (Peterskirche).